Not a bad motto for a police officer about to head off to work. 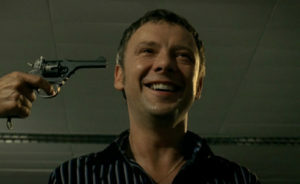 (It probably beats “Let’s be careful out there.”) But for Sam, it’s a challenge, especially considering that he’s heading off into a hostage negotiation, surrounded by trigger-happy cops like Litton (who actually has to be persuaded that no loss of life is, in fact, the optimal outcome). More than that, thanks to a phone call from a disconnected phone, he knows that, back in 2006, his mother is going to let them “pull the plug” on him that afternoon if they don’t see any brain activity. So “Nobody Dies Today” is an imperative — and a nearly impossible one, as Sam has to manage to not get himself shot in 1973, and not get himself unplugged in 2006. While he’s got some ideas on how to deal with the former, he’s absolutely clueless on the latter — except for an intuitive understanding that if he resolves the hostage situation without bloodshed, it would be a good start. I’m getting ahead of myself. Quite a bit happens before Sam and Gene find themselves handcuffed to a radiator while Reg shoots a hostage. 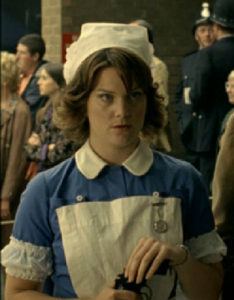 First, they send Annie in as a nurse. Interesting that Sam doesn’t want to send her because it’s too dangerous, and Annie points out that it’s part of the job. (What is our modern-day officer doing? Acting overly protective toward the female officer?) Instead, Gene is the one who calmly evaluates the pros and cons of the plan and approves it. (Admittedly, there is something in Gene’s look that suggests one of those “pros” is getting to see Annie in a nurse’s outfit, but still.) He wants to give her a gun, though. Remember this. Speaking of remembering, wasn’t it just last week that Sam pointed out to Annie that you don’t call Gene “Guv” when you’re undercover? Geez, Annie, way to drop the ball on that one. But, of course, it worked. That happy memory was just strong enough to make 2006 comatose Sam (assuming there is a 2006 comatose Sam) smile, which is enough to make Sam’s mother keep him plugged in. (Irony there — it isn’t a memory of Mum, the one who actually raised him, that gets the reaction.) A botched rescue attempt manages to save Sam in 1973, too — although it takes a well-placed kick in Litton’s “knackers” and an even better-placed flask in order to assure that Nobody Dies Today.